The Trout Hotel is idyllically set in the Georgian GEM town of Cockermouth and offers guests a fusion of exceptional service, peaceful riverside views, characterful rooms and multiple award-winning dining settings. With buildings dating back to the 1600’s, the independently owned hotel was once a favourite of Hollywood legend, Bing Crosby. Today an AA 4 Silver Stars establishment, it continues to provide the perfect base for exploring the Lake District – with an array of scenic walks and premier visitor attractions on its doorstep. 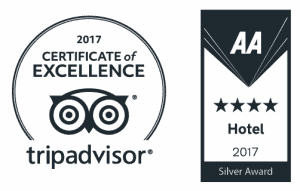 Challenge your taste buds in our timeless AA Rosette restaurant, contemporary bistro or comfortable lounges, which are classed among the best places to eat in Cockermouth and the surrounding area. History and culture, peace and tranquillity, romance and enchantment. All can be discovered during a stay at the AA Silver Star Trout Hotel in Cockermouth. From tempting Lake District offers to seasonally themed evenings and enticing restaurant deals – whatever the occasion and whomever you would like to make smile, the Trout Hotel has a range of exclusive offers to share. Stay any three nights for the price of two, including breakfast, and receive an exclusive voucher pack with discount vouchers for the Lakes Distillery. Make some family time and enjoy superb Easter Offers in the Derwent Restaurant. Come on down to the laid back Terrace Bistro and Bar to enjoy a wonderful night of live music. With our compliments, enjoy a collection of afternoon tea vouchers to use at the hotel. On the first Wednesday of every month, dine in the Terrace Bistro and save a little by bring your own bottle. From 23rd April to 10th May 2019, a two course meal in the Terrace Bistro will be £12 and a 3 course only £15! We’re located on the banks of the River Derwent in the Western Lake District – where enchanting lakes, picturesque valleys and striking woodlands make up one of the most spectacular areas of the national park. Quality and character are what make the Trout Hotel’s rooms so special. Choose from luxurious cottage suites with their own private garden, or elegant superior executives with peaceful river views.